Posted 8/25/2016 8:36am by Ben Wenk. Welcome back, my fellow nerds! When we last spoke, we were discussing frost damage and the science behind it and the conditions that affect it. I feel like I owe you all a third and final entry on what happened this summer with the crop that survived. But before that, let's go back to a topic we introduced last year around this time of year - measuring apple maturity. If you recall from vol. I, it's common for these kinds of evaluations to start by qualitative analysis by people with color vision. I'm not so great at the color vision thing, so I'm training myself in the more quantitative methods. I referenced, in that entry, the penetrometer. In this entry, you'll see it put to use. Don't worry, it's safe to view at work! 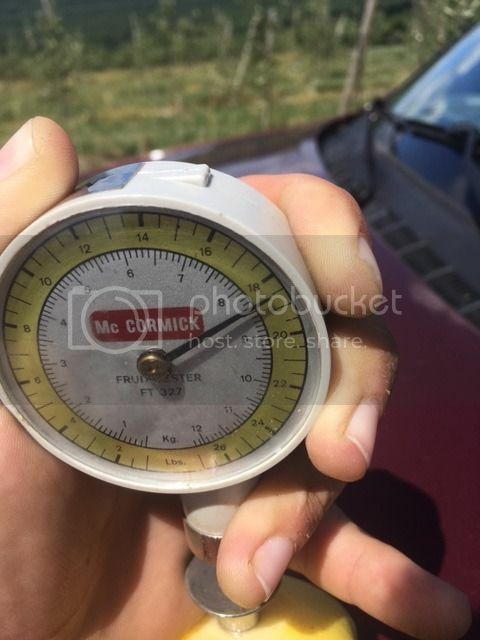 Apple firmness, measured in pounds per square inch, is a common maturity analysis for apples destined to be processed into apple sauce, pie filling, juice, and cider. 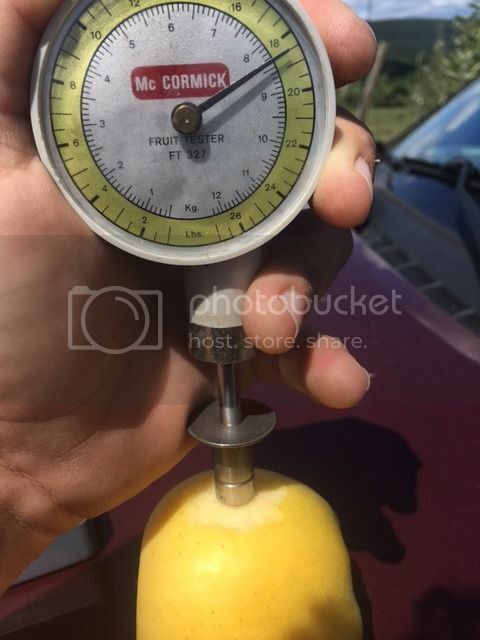 There's a minimum pressure (16 psi) fruit processors require to receive fruit as "premium" - below this measure, pressure can be limiting in terms of which products can be made with this fruit. 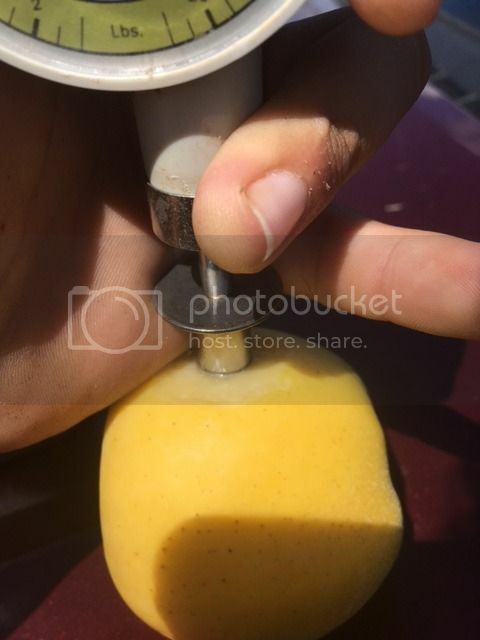 While it's most useful for processing fruit, we're very familiar with what to expect for changes in firmness over time so it's also useful for fresh fruit analysis around here, especially when paired with spectrometer reading (see entry 1) and when you make multiple readings over time. I'm hoping to start checking for starch with iodine as also referenced in entry 1 but for now, let's see just how this instrument is used. Once you've assembled your penetrometer, the next step is to pick some fruit! I usually start with the one that, visually, looks the "most ripe" or the one that picks the easiest - two qualitative visual cues. Then, I try to pick another fruit that "representative of the rest of the tree" or block, in some cases. This way, I can communicate to the harvest crew us how much of a spot-picking job this is going to be. Some varieties ripen more uniformly than others. The apple I'm testing in these shots is the new, syrupy sweet selection known as 'Blondie'. Fruit in hand, we first use a knife (no farmer should be caught without one) to remove the fruit skin (above) - this is a measure of the firmness of the apple flesh. We use a hand held penetrometer - great for field tests. If you were conducting research using firmness as a metric, you'd need a bench model that insures even pressure, steady pressure, and a perfect perpendicular angle. No such needs in our case, but one thing in common with both is a defined depth of penetration to remove that variable. This close up shot shows the indented ring at which the reading is taken (right). Then, holding the apple still on a firm, sturdy surface with one hand, the plunger shown in that picture is pushed into the flesh of the apple until the plunger reaches penetrates the distance from the bottom to that line. When that line is achieved, you remove the penetrometer and take your reading. 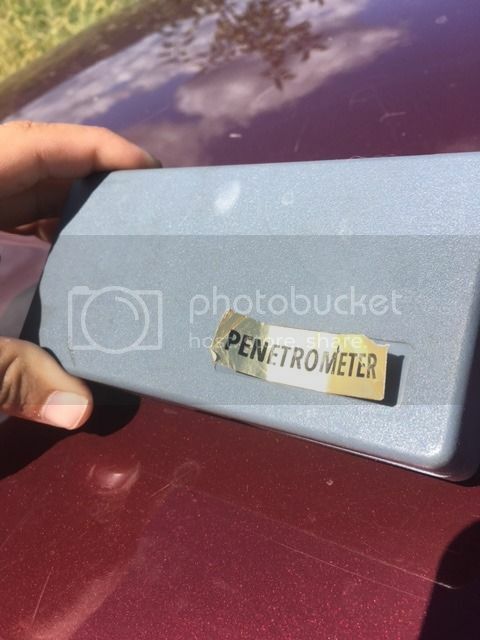 The penetrometer is designed kind of like a high/low thermometer - the needle freezes at the maximum pressure applied. 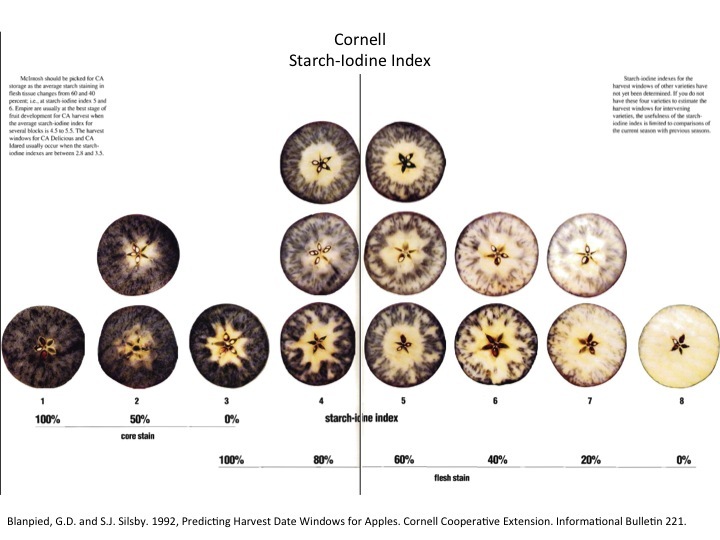 So for the best reading, it's important to stop pushing after you hit that line - the apple flesh will get firmer the closer to the core you get. 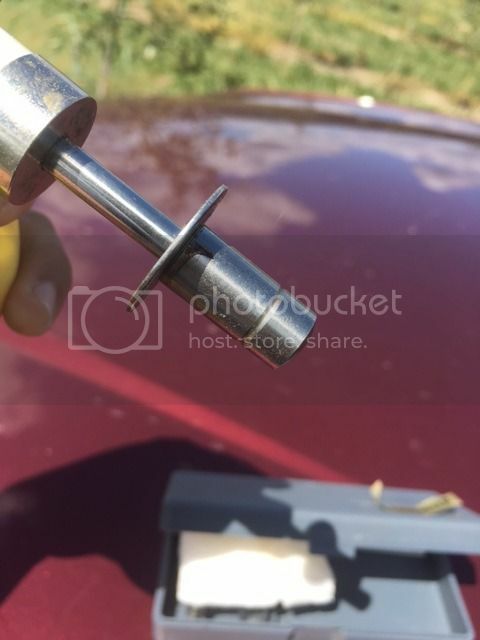 Below are pictures of the penetrometer in action - keep in mind, the methodology described above doesn't leave a hand free so I'm attempting to steady the apple and push the penetrometer with the same hand (huzzah). When you're trying this at home (ha!) 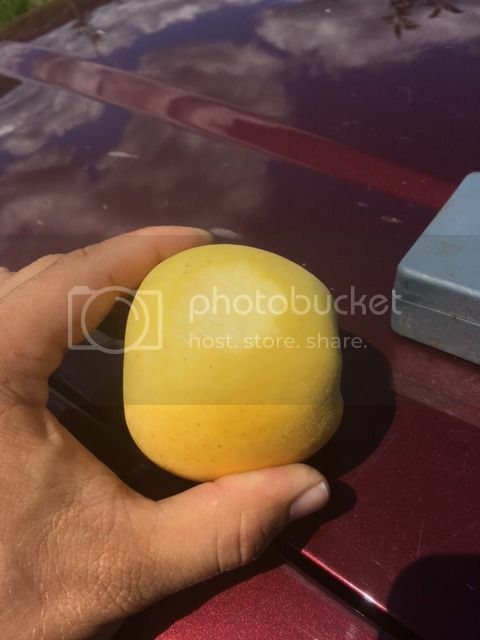 without the camera, it's one hand on the fruit one hand applying even steady pressure at a perfect downward angle on the fruit. Blondie at 15.5 brix (not pictured) and 18.5 psi? She's ready to go. Enjoy those apples, nerds and be sure to check back in for more nerdy detail.